Coven: The Village adds a less abstract setting to your game of Coven, with more flavour and storytelling. The game is set in early 16th-Century Europe, where you are a practising witch living in a small village not too far from Innsbruck, Austria. Martin Luther has recently posted his 95 theses, setting off the firestorm of religious wars known as the Reformation. Malleus Mallificarum has been published and, although condemned by the church, is widely used in the persecution of witches. Coven: The Village includes a new rotating Inner Wheel to replace the one from the base game. It also adds 36 Village Cards that replace the original Balance Cards, and a Village card is read when the new Inner Wheel triggers the Full Moon. Suspicion Tokens track how suspicious the villagers are of each player, and are gained whenever you increase Balance. Players under suspicion may also gain Personal Edict Cards, which are penalties that last for the remainder of the game, and may even prevent you from winning unless certain conditions are met. 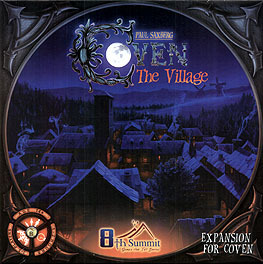 Coven: The Village also includes 36 Village Cards, 15 Personal Edict Cards, 30 Suspicion Tokens, 5 new Reference Cards, Rules, a six sided die, and an additional Spindle. You must own Coven to use this expansion.